I will seriously bear this in mind. People might see you and ask if you could take a look at their car. I guess you’d have to decide whether or not that was a good thing. Oh, that would be great. I could just, like, slide on some sunglasses, and make some finger guns, and be all “sure thing man. NICE WHEELS.” And then run away. That is the best response. 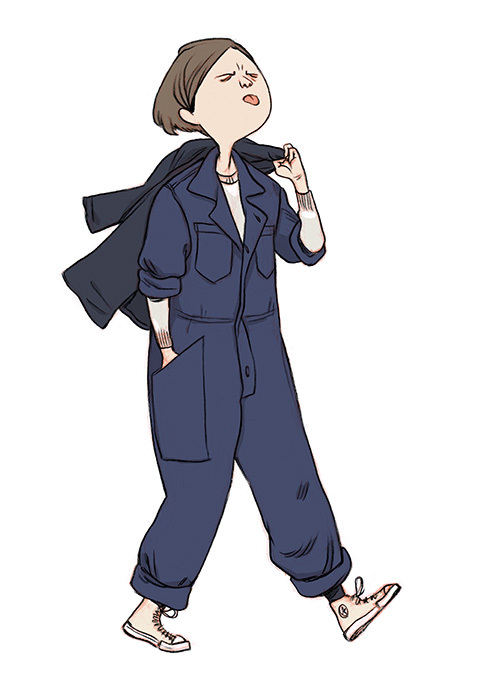 I have a pair of khaki dickies coveralls I use for pottery and I loovvvee theeemmmm. I have a little art tool box for my supplies and I usually wear a ball cap and I feel pre-tty slick. They make me feel a bit dapper and ready to get down to business. I was in this same situation though! I had bought my coveralls previously and they were sitting in my closet. I really wanted to wear them out, but I eventually got into pottery so that became my excuse. I think if you get them in an interesting color it’ll push it more towards fashion territory, maybe with like some docs or something with the trousers rolled up. I couldn’t find a pair small enough when I was originally hunting for them so I had to order it off amazon. I went to Army & Navy initially but they were too big. I actually almost re-drew this picture before I posted it, to switch the converse for docs! Yeah, I hadn’t thought about the sizing – I forget that workwear sizes run large. I say I want them baggy, but probably not sooo baggy. I like that you wear them to pottery – it makes me wish I had the studio space for proper large scale painting, because they’d be perfect for that, and then I’d really have an excuse to hunt a pair down. And they’d be twice as awesome, all casually paint-smeared. Deepest pockets for treasures and snacks ! A demi baguette could fit in one of those pockets. I’ve recently worked out that my aesthetic seems most easily labelled as ‘space cowboy’ and I’ve also taken to looking for a flight suit. One that I can sew a few space-related patches to and wear with my black boots replete with silver conchos. I found a pair of 80’s era beige coveralls last year. They’d never survive any type of serious work/outer space/motorbiking environment, flimsy enough that my underpants show through them, but there’s a tiny label on the left breast that just says “dreams” in cursive.